Next I will explain two initiatives aimed at strengthening profitability. The first consists of measures to liquidate assets. 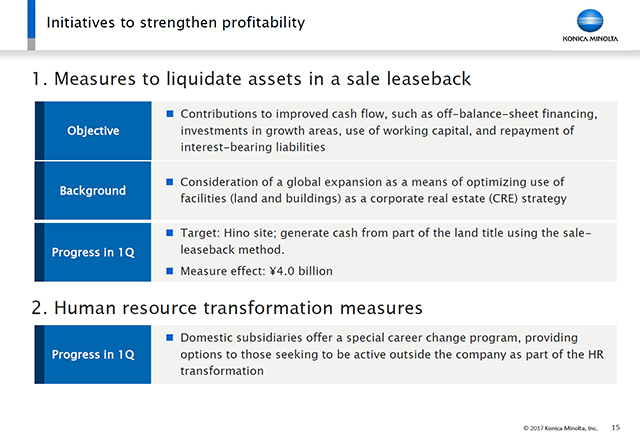 Due to the use of a sale & leaseback scheme for the ownership rights to part of the Company's Hino site, a ¥4 billion gain on sales was posted in 1Q. The goals are given in the materials, but our aim is to improve cash flow by carrying out financing through shifting fixed assets off the balance sheet, using those funds to invest in growth areas, making better use of working capital, and repaying interest-bearing liabilities. Just to touch on the background of these measures, in fact we have been moving forward with this approach since the previous Medium Term Business Plan "TRANSFORM 2016," and have optimized it for use with the facilities as part of a corporate real estate (CRE) strategy. It is one of the items that we have started to consider with a view to rolling out globally. With regard to the sale & leaseback, on this occasion we were offered favorable terms from a trustworthy partner, which explains the timing of our implementation. Going forward, I would like us to continue to implement such initiatives, while paying attention to the terms and the timing. The second consists of measures for the transformation of human resources. With regard to structural reform, in the first quarter we implemented a special career change program for domestic subsidiaries. These measures provide, as part of the HR transformation, options to those seeking to be active outside the company.